A Year of Being Here: Martha Sprackland: "Refugees"
I brush tears to the grass. sits down with a bump. and he gazes at me intently. and he takes it. A flicker of a smile. I put my arm around his skinny shoulders. Silently, together, we sit, and think, and cry. "Refugees" by Martha Sprackland. Text as published on the website of The Poetry Society (UK) (1999). © Martha Sprackland. Reprinted by permission of the poet. 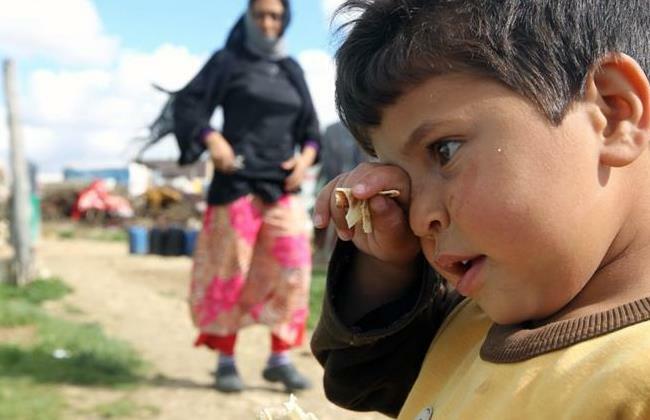 Art credit: "A Syrian refugee boy eats bread in the Western Bekaa village of Jub Jennin [Lebanon]," photograph by Niamh Fleming-Farrell /The Daily Star(03/14/2013).